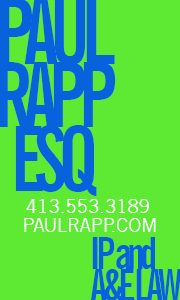 (HUDSON, N.Y.) – Food trucks are all the rage these days, springing up everywhere in cities and towns across the country – everywhere, that is, except where local authorities, often prodded by restaurateurs who view them as unfair competition, prohibit them. But even there, the tide is turning in favor of these low-cost options for outdoor and takeaway dining. And there isn’t a more timely and welcome book that addresses the food-truck phenomenon than Brian Branigan’s Food Truck 411: The Essential Information to Run a Successful Food Truck. 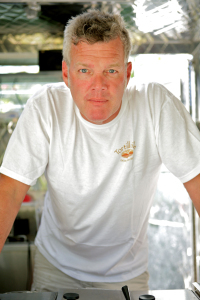 Locals know Branigan as the proprietor of the immensely popular Tortillaville at 347 Warren Street, where he dishes out handcrafted burritos and tacos and other specialties that are healthy and wholesome and filling and incredibly delicious. Equally appealing is Branigan’s book, from its exquisite design (provided by Branigan’s life and business partner, Allison Culbertson) and photography to its wealth of practical business information and recipes (the latter also credited to Culbertson) to its folksy, first-person narrative that is all Brian. This book is many books in one: a memoir of how this fascinating couple, one a graphic designer by trade, the other a videographer with years in the film business, managed to find themselves, like many, leaving New York City for the upper Hudson Valley and reinventing themselves in mid-life as food-truck purveyors. A how-to for those convinced they want to make a go of the food-truck business. A red-flag warning those one-and-the-same that they may want to reconsider. A recipe book. 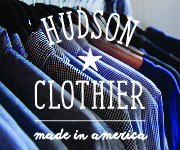 A quintessential story of present-day Hudson. A life-hacking guide to how to balance work and pleasure. Or more generally, an inspirational and practical guide to finding one’s “Plan B” in middle-age and how to run a business – any business, really. Branigan is generous with a wealth of information, including lists, charts, facts, figures, recommendations – a lot of stuff that others might prefer to hold close to their vest as proprietary. He’s a savvy writer and entrepreneur – he knows and admits that the book is part marketing device, intended to grow his business even more and probably, eventually, luring a potential buyer. The book could easily be a springboard to a Plan C, which could be as a consultant or spokesperson for the food-truck industry. But Branigan seemingly already has his Plan C; he is drawn to the water, and winters in Florida, where he spends his time captaining sea vessels. 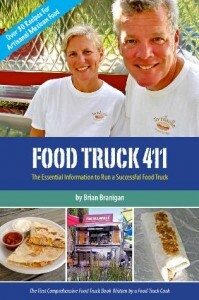 Branigan is an affable writer; anyone could enjoy reading Food Truck 411 just for the story, the adventure, the fascinating backstage glimpse it provides of all the steps that go into making that terrific burrito, or, as some will undoubtedly say, even just for the pictures. As for me, it made me hungry, and I know where I’m headed tomorrow, and the next day, and the next, and another day (to paraphrase David Bowie).